We are specialist in designing untypical stands and we offer a high professionalism, good quality of the complex service and promptness. We are the member and co-founder of Polish Corporation of Trade Fair and Exhibition Organizers. We received many awards for our implementations, awarded by Poznan International Fair - Gold, Silver and Bronze medals and since 2003 ACANTUS AUREUS certificate. 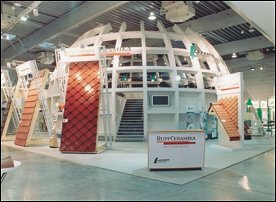 In 1999 and 2005 we have got the award for stand of the year- awarded by the Polish Corporation of Trade Fair and Exhibition Organizers. In 1997 and 2004 we have got the award Trade Services Leader awarded by the Polish Corporation of Trade Fair and Exhibition Organizers. We brought into operation Polish Pavilion on EXPO 2000 (cooperation with Zakład Budowy i Dekoracji Stanisław Górecki) and EXPO 1998.